In the middle of June R and I headed off to Amsterdam for a few days. We didn't do much planning or reading up about what to do or see, which is generally how we roll when it comes to holidays. We flew out on a Sunday afternoon (having left the cat with my parents) and took a taxi over to our hotel in the oud-west part of the city. We stayed in the Hotel De Hallen, which is built within an old tram depot building, and seemed very cool. After settling in, we decided to have dinner in the hotel restaurant, and took advantage of the sunny weather to sit outside. We both had burgers, which were so good, and then took a walk around the block to check out the local area, which also seemed very hip. The whole area seemed to be newly developed and it also housed a foodhall, independent boutiques selling stuff from local makers and a cool looking cinema. On the Monday we went for a pancake breakfast, and met the cutest black and white cat that walked in and out of the cafe. We decided to check out the Vondelpark and Rijksmuseum before lunch, where we strolled around awwing at the dogs before I fell in love with this painting in the Museum. I would really recommend a visit there, especially as outside there were classical musicians busking on the street. For lunch, we retreated from the heat and shared a hot dog and the biggest stroopwaffel I ever did see. Afterwards we slowly meandered back towards our hotel for an afternoon nap before having dinner at the foodhall next door. We tried spring rolls, crispy fried vegetables, and mini cakes. The spring rolls were the resounding winner, so so delicious. Tuesday we had the best pancake breakfast at Pancakes! I tried the banana and chocolate sauce combo, while R had the ham and cheese. Both were really good! We then walked into the old part of the city, got some photo booth pictures from the booth at The Hoxton and chilled in cafes with fresh peppermint and ginger tea. Neither of us had gotten over how good the spring rolls were at dinner the night before, so decided to head back to get some more for our lunch, as well as tacos. To round it up we picked up an ice cream pot from La-la-Ijs which had a wide range of flavours, many of which were vegan. We opted for pistachio and a vegan chocolate with marmalade flavour, both of which were delicious. For dinner we headed to Casa Sabatelli which was really cute and had the bonus of being located next-door to a shop with a cat asleep in the window. We shared ham and mozzarella foccacia, pesto pasta and lasagna. The food was good, but nothing particularly special and the desserts didn't really appeal, so we popped into a corner shop and picked up some hazelnut milk chocolate which was in-cred-i-ble. Wednesday was our last day in Amsterdam, so after checking out of our hotel we went to Anne & Max for breakfast- porridge, smoothie bowl, coffee and fresh mint tea! After chilling there for as long as possible we checked out the local shops where R picked up a fancy new wallet and a simple ring for me as souvenirs. We then made the most of being in the area and went back to the foodhall for lunch, this time trying a tikka wrap and burger. After we had taken full advantage of all of the various stalls at the foodhall we slowly walked towards the south of the city, taking in the Vondelpark again and ending up at a different Anne & Max for tea, a turmeric latte, and dutch apple cake. By now it was time to say goodbye to Amsterdam so we headed to the airport, excited to be reunited with the cat. 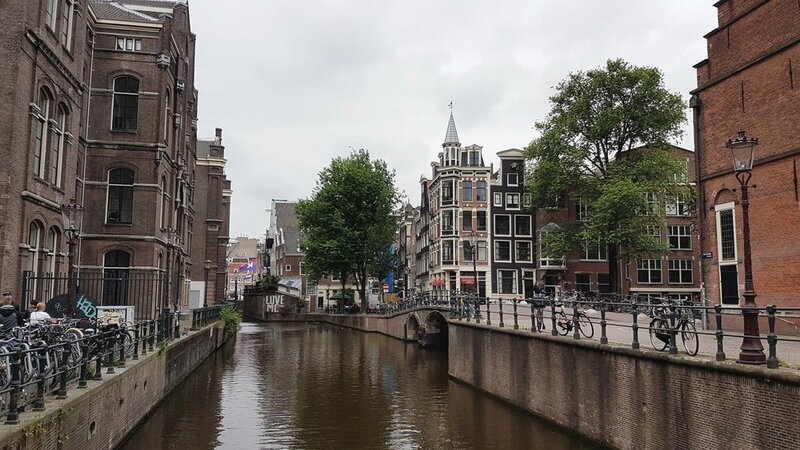 We both really loved Amsterdam, and it's another city that I could definitely imagine myself living in- especially as nearly every building had big dreamy windows. We didn't take full advantage of everything that was on offer, but the little lazy break was just what we both needed after having been stressed out in the run up with hospital visits! I had taken my camera with me, but ended up relying completely on my phone to take pictures, which was just so much simpler. I think we both hope to visit again sometime to explore more of the city- it's on the list! 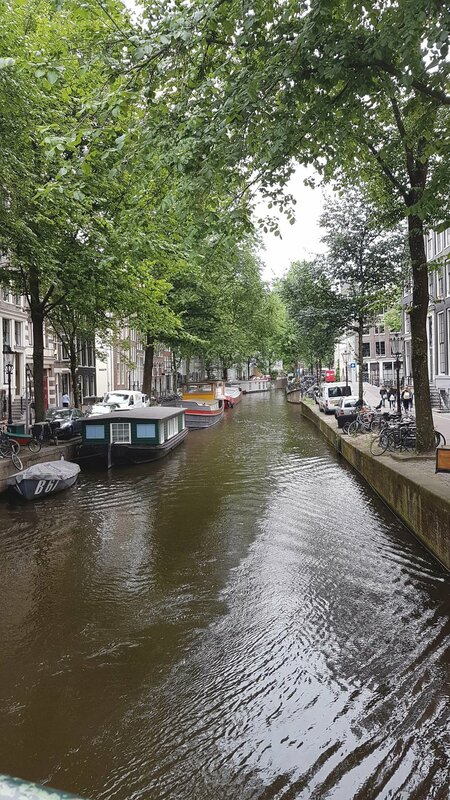 Have you visited Amsterdam? Any recommendations on where we should visit next?